Dr. Ishigaki, I would like to thank you for this interview. My interest in Tenkara originates from lite line fly rods and large trout from small streams. I make bamboo fly rods and three years ago, I embraced Tenkara and have yet to look back. My friend Satoshi Miwa has helped me with my research into Tenkara in Japan. I would like to thank Satoshi-san for helping me translate this interview so that our thoughts are not lost in translation. In the Japanese books that I own, all pre-date the introduction of Tenkara to America. Books by Hiromichi Fuji and Soseki Yamamoto; Dr. Ishigaki is referenced and included. I am so impressed with his participation in Tenkara as it has been for decades in Japan and now you are spreading it around the world. I am so happy that we are able to understand you as a direct ambassador from the early history of modern Tenkara. It is an honor to be able to conduct this interview. Adam: Dr. Ishigaki, I understand that you spread Tenkara fishing to the world for quite some time. I think that is quite an accomplishment for Japanese Angling and for the art of Tenkara. Dr. Ishigaki: I sense your sincerity and strong enthusiasm for Tenkara. So, I will also try to tell my thoughts as sincerely as possible. It’s already been 37 years since I first learned Tenkara. At first, I enjoyed Tenkara only for myself. However, Tenkara was so fun that eventually I came to have a desire to popularize this fishing more. Tenkara has made me very happy, and I also want you to be happy by this fishing. I am a university professor* and I’m good at explaining things logically and comprehensively. I think this has helped me spread Tenkara among people very much. Besides, if I may say so myself, I am a very friendly person, and, through this fishing, I made friends with many people, who also helped me promote Tenkara. Though my contribution to Tenkara may have been small, the number of people who enjoy this fishing is steadily increasing in Japan. Tenkara is the old, traditional “fly fishing” in Japan. I believe Tenkara is a culture comparable to the fly fishing that has originated in Europe. Japanese people should be proud that we have tenkara in this country. One of the reasons why I’m trying to disseminate Tenkara is that I would like Japanese people to know Tenkara, which is a traditional culture of Japan. Looking back on my years of promoting Tenkara, I think I helped increase the number of people who enjoy Tenkara in Japan. Overseas, I believe I was able to show there is a Japanese style “fly fishing” called Tenkara that is comparable to the western fly fishing. *: Dr. Ishigaki is a professor of sports science at Aichi Institute of Technology, although he doesn’t teach Tenkara in AIT. Adam: American fly fishers seem quite receptive of Tenkara. Personally, I started out fly fishing as a young boy in the mountains of Utah and Arizona. I am so happy to understand Tenkara as a mountain stream fly fishing pursuit. 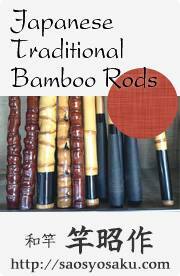 It has sidelined my making of bamboo rods and fishing them for the last few years. If you suggested that to me ten years ago, I would not have thought that could happen. Dr. Ishigaki: I have been fishing for more than 50 years. Over these years, I enjoyed many types of fishing: in the sea; in lakes; and in rivers. I particularly liked fishing ayu*, and I devoted all my spare time to ayu fishing during summer, but eventually I quit all fishing except for Tenkara. After a long wandering journey in the world of fishing I finally settled on Tenkara. Tenkara means all to me, except for my family, of course. I truly love it. It’s difficult to explain the reason. The beautiful environment of fishing certainly counts, such as mountains and pristine water, as well as beautiful trout. They are not fundamental, however. Then why do I love Tenkara so much? I think it’s because tenkara is the ultimately simple way of fishing. All you need is a rod, a line, and a fly. Tenkara doesn’t depend on the fishing tackle. There is no need to use bait, a sinker, nor an indicator. To catch fish with the simple setup of Tenkara, your skill is all-important. If you cannot catch fish, your skill level is not enough. For Tenkara, you need an ambition to improve your skill. This falls completely in line with my work as a researcher; I want to do more research, and want to know more truth of nature. I can work hard in my job, because there is Tenkara. *: Ayu (Plecoglossus altivelis) is an osmerid fish and not trout, though the fish has an adipose fin. Ayu is the most popular game fish in freshwater (though the fish is not caught by Tenkara) and also praised as a delicacy in Japan. Adam: I believe that Tenkara is here (in America and around the world) to stay. It has simplistic qualities that satisfy the basic desires of fishing. Tenkara holds a lot of interest due to the excitement of catching trout in such close proximity. Like many new pursuits, these are the early days of Tenkara in America. 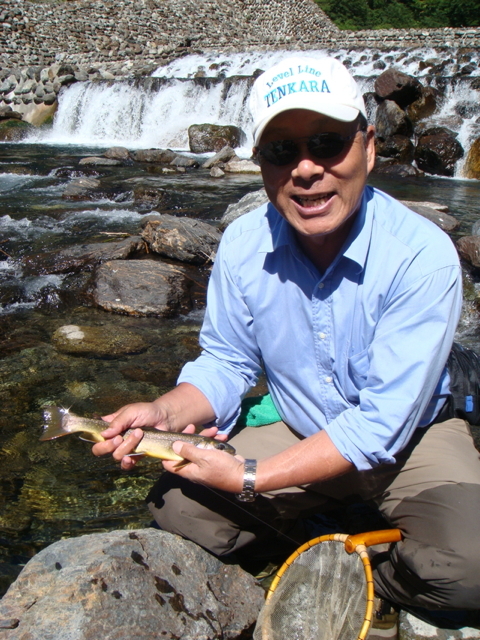 Dr. Ishigaki: I don’t have many friends in America, neither have I seen many tenkara fishers there. My opinion is based only on my limited experience. I think, in general, Tenkara has been successfully introduced into America. It will become more popular gradually, though I don’t think the method and spirit of Tenkara are not transmitted as they are in Japan to America where the fly fishing from Europe has already been well established. For example, in Tenkara, we use principally only one fly, or just a few. Tenkara doesn’t depend on a fly. Certainly there are Tenkara fishers who frequently change their flies, but these people are rare. In America where changing flies is thought to be very natural because of the existing fly fishing culture, I doubt if the idea that one fly is enough can be accepted. Also, in the country where people are used to cast a thick, heavy fly line, I wonder if people can adopt the casting with a level line which is very thin almost like a tippet. In these two points, Tenkara in America is different from that in Japan. I would expect, in American Tenkara, most of the people will use fly lines and change flies frequently, which is fly fishing after all, just with a longer rod without a reel. Indeed, I saw some American Tenkara fishers use fly lines lying flat on water surface and drift a fly for long distances. That is the method of western fly fishing itself. As far as I know, there are only a few people, including Daniel Galhardo, who inherit the genuine Japanese style of Tenkara in America. Adam: This may be a hard question due to our language differences. My apologies in advance if it is. I have seen the evolution of many sports and disciplines divide into specialties. For instance, when mankind began to fly, we started gliding down slopes without a motor. As the simple wings evolved in the ability to navigate the air, they were made stronger and a motor was added. No longer was the pilot connected to the hill. Now the pilot could fly anywhere he wanted and the airplane was developed more around the engine. Gliders did continue to develop but much more slowly as the interest changed from just gliding down a slope for sport to actually flying for industry. Gliding developed on its own out of pure recreation and has now surpassed some of our wildest soaring dreams yet gliding is a small aspect of the whole of flying even though it is the basis of aviation. I see similarities in the different forms of fishing. There are forms of fishing for food, other forms of fishing for recreation. From the little I have read on the history of Tenkara, it is a discipline born from necessity of a profession, a fishing job to sell fish to market. I see Tenkara as “gliding for the love of flying” rather than fly fishing because that is what everyone does. Dr. Ishigaki: I think Tenkara and fly fishing are two different things, because the two have developed in different types of rivers and surrounding environment. First of all, the ideas about flies are different between the two. In the fly fishing developed in England, it is thought that a fly should imitate the shape, color, and size of natural insects that are eaten by trout, since trout obviously select flies in a river which flows flat and slow. On the other hand, mountain streams in Japan run fast and a drifting insect passes the territory of trout rapidly. Hence, trout doesn’t have time to scrutinize a fly. Trout takes anything that is the similar size and looks vaguely like its bait. If it’s not edible, they just spit it. Since Tenkara relies on such a behavior of fish, the fly shape and color are not important in this fishing. Fly size may be important, but usually it is thought that a fly of size #12 can take fish irrespective of season, place, or trout species. Although this overlaps with the answer to your question (3), the second difference is that fishing with Tenkara doesn’t depend much on its tackle. This is a traditional way of thinking in this country. For instance, the rooms in a traditional Japanese house can be separated or merged by the partitions called “husuma” or “shoji”, both of which are made of wood and paper, so that the size of rooms can be changed flexibly. This is one of many examples. People often utilize one thing for multiple purposes in Japanese culture. Tenkara is different from fly fishing in this respect. Nevertheless, I think fly fishing can be deepened by adopting ideas of Tenkara. It seems there is a hint in my experience that trout can also be caught by Tenkara in mountain streams in American just as in Japan. Other than America, I have also fished with Tenkara in Canada, Korea, and Taiwan. I caught fish in the same way as in Japan anywhere. In any river, there is a headwater, a rapid stream part, and a place where it flows wide and slow. There is no difference between mountain streams in Japan and in America. Trout don’t speak English in America. Also, Japanese fish don’t speak Japanese language. The behavior of fish is the same anywhere in the world. As in Japan, trout is not very selective in fast running water in America. The method and idea of tenkara would be of use for the fishing in mountain streams in America. For people who are bothered with complication of fly fishing, the fact that fish can be caught by very simple tackle and a fly would be good news. Adam: In America, our fishing magazines are starting to include Tenkara as a new topic, it is gaining acceptance. Although I do not purchase magazines, I understand that a lot of the magazine’s Tenkara content is on tying flys. "Can you tell us why only one fly? Is it a discipline in restriction? And or to force the learning of rod, how to effectively manipulate the fly?" Dr. Ishigaki: There are three reasons why only one fly is enough. 1. As I said in my previous answer, trout is not very selective in fast water. 2. Fish doesn’t have very good eyes. Their vision is blurred. In other words, they cannot see details of a fly like we do. 3. If there are a hundred Tenkara fishers, their flies all differ from each other. In other words there are a hundred different types of flies among them, and every one of them can catch fish with his/her fly. This means that there is no particular pattern you have to follow in Tenkara flies. Thus, fly patterns are not important in Tenkara. What is important is the technique to show fish a fly as if it’s a live insect. To achieve this, there are various techniques such as to drift the fly close to the surface or deep in the water column, to make the fly wiggle like an insect, or to sink the fly and then raise it. The system of Tenkara makes these techniques possible. Adam: I still feel new (three completed fishing seasons) when it comes to Tenkara experience. I continue to try different lines. I enjoy braided tapered lines for steep mountain streams and I use level lines for open valleys and the mainstream. "What lines do you use for fishing different types of streams and why?" Dr. Ishigaki: I use only level lines. In the years of my Tenkara fishing, I have also used different kinds of lines, including branded lines, but the long experience taught me no line is better than level lines. There are too many advantages of using a level line to explain here. Most of the Tenkara fishers in Japan use level lines, because once a person uses a level line he immediately understands its merit. Since the number of people who use level lines has increased, some producers now sell level lines exclusively for Tenkara. All are fluorocarbon and colored for visibility. In fly fishing, a fly is cast by the weight of a fly line. On the other hand, the merit of a level line is its lightness. A light line can be cast if you can give enough speed to it. You can’t cast a level line if your casting speed is slow like you cast a fly line. Thus, a person who has been using fly lines may think that level lines cannot be cast well, but it’s actually because he doesn’t cast properly. I change the length of the line according to the width of rivers. The line thickness I use is #3.0 to 4.0. These numbers are indices to indicate the thickness of lines in Japan*. *: The thickness of #3.0 and 4.0 lines is supposed to be 0.285 and 0.330 mm, respectively, but this may differ slightly among producers. Adam: It is my understanding that you were involved with the development of the Shimano Mainstream ZE. I own one and it is an interesting concept with the “Zoom” feature in its variable length. As an owner of the Shimano Mainstream ZE, I am very interested in it’s development and especially the way you use the Zoom feature. Dr. Ishigaki: Thank you for using Mainstream ZE. It took 2 years for me to develop this rod. As you know, the length of the rod can be changed from 4.0 to 4.5 m (Approx. 13.3 to 15 ft). I change the length depending on the size of the river, though most of the cases I set the length at 4.0 m. If a big fish is hooked, I change the length to 4.5 m so that the action of the whole rod, in effect, becomes slower, which in turn makes playing and landing fish easier. I also set the rod at 4.5 m when I cast a long line (as for me, it’s about 8 m (26 ft) ). This rod is made very robust and doesn’t cause many troubles. Adam: In my kit, I carry as little as possible when fishing close (within a mile or two of the car) yet I sometimes hike a few miles by myself deep into the forest. During those times, I pack a minimal survival kit of bivouac sack, stove, and bear spray. I prepare myself for an overnight on those trips just in case. "What do you carry for a day on the stream? 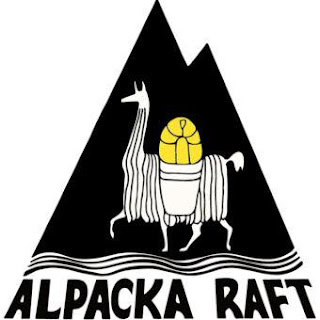 Do you still adventure into the mountains camping and fishing?" Dr. Ishigaki: For day trips, I guess the contents of my backpack are not very different from yours. I bring a spare rod, lunch, and water, though I don’t bring equipment for survival. Even for day trips I always go with one or more friends. We can help each other and we can cut down the contents of our backpacks. When I was young, I used to carry a heavy backpack and spent days in deep mountains, but I don’t do it anymore. Adam: In the past, I have gone through phases where I carry a net and times when I do not. I am now carrying a small round net that goes with my release box and camera. Although I am fishing, I want to protect the fish from injury and photograph quickly to enjoy the beauty of the fish. "Can you tell us a little about the Japanese net you carry? And do you use a release box?" Dr. Ishigaki: I also release all fish I catch like you. I use a net so that I don’t have to touch the fish directly with my hands. Besides, taking fish photos is easier because I can confine fish in the net for a while. The net I use is a Japanese net made of wood and deer antler. This is a standard net for mountain streams in Japan. I don’t use a release box, though there are people who use it in Japan. 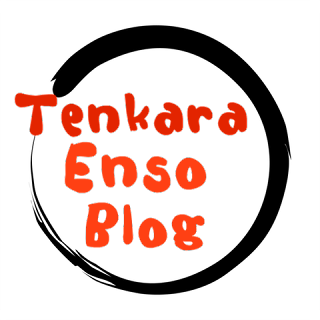 Adam: I have previously interviewed Daniel Galhardo from TenkaraUSA. I am thankful to Daniel for selling to me, my first Tenkara rod, the Ebisu. In my quiver of rods, I use a "Seki Rei" by Sakura, Enshou Daiwa, Fuji Nissin and a few other rods but not necessarily in this order. I see that you sometimes carry a rod tucked in your belt. Dr. Ishigaki: I answer to this question together in the next answer, since they would overlap with each other. Adam: There are so many types of Tenkara rods. Stiff, full flexing, soft, hard, each rod action can be an attribute to the angler and there are rods that really shine while others just feel like a stick. "Can you tell us about the design of a good Tenkara rod? Do you design these rods with a computer or do you do it by feel or both? What is your favorite(s)?" Dr. Ishigaki: I’m advising Shimano on the development of Tenkara rods. So far, the only rod on the market I was involved in the development is “Mainstream ZE”. From December 2012, Shimano will start to sell “Keiryu Tenkara ZL”. This is a “zoom” rod from 3.4 to 3.8 m (11.3 -12.6 ft). If Mainstream ZE is the older brother, this Keiryu Tenkara ZL is its younger brother. I was involved in the development of this rod for 2 years. First, I fish with a rod builder of Shimano in a stream, and I will explain what I think the ideal tenkara rod should be like to him; the length, action, thickness, weight, grip, etc. Then, the rod builder makes the first prototype. We fish again together with the rod and I suggest points of improvement. We had repeated this process five times for Keiryu Tenkara ZL before I finally gave the green light. I don’t compromise until I’m truly satisfied. Thus, it takes two years to develop the final product. I appreciate Shimano’s effort to make a rod that almost meets my ideal. The rod that I think is ideal would bring benefit to many Tenkara fishers. It would be my greatest pleasure if people can enjoy Tenkara more by using this rod. 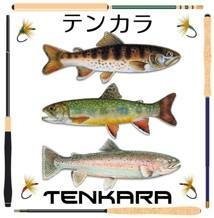 A Tenkara rod plays major roles in three occasions: casting; hooking; and landing fish. The rod that can play all these roles well is the ideal rod. For a new rod, things I consider include: the length; action; thickness; weight; feeling of holding the grip; and the collapsed length of the rod. The worst reputation of a rod is “easily broken”. This would also damage the reputation of Shimano too. If you make a rod thinner, it will become lighter, but it can also be easily broken. A slow action rod is easier to cast but has weakness in hooking and landing fish. In addition, price setting is important. However good a rod is, people won’t buy it if it’s too expensive. I produce an ideal rod by taking all these into account. Now, “Keiryu Tenkara ZL” is my ideal rod. 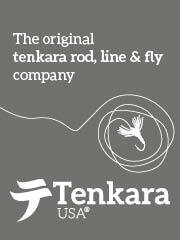 This rod will probably occupy a substantial share in the market of tenkara rods in Japan. Adam: My recent interview of Masami Tenkarano-oni Sakakibara was enlightening. 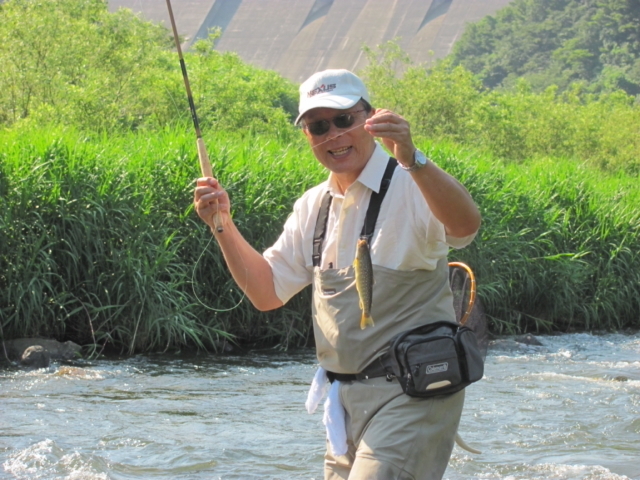 Mr. Sakakibara also has designed rods and he is quite an enthusiastic Tenkara angler and ambassador too. I understand you two enjoy fishing together. Surely you have a few adventures high in the steep mountain valleys of Japan’s wild mountains. 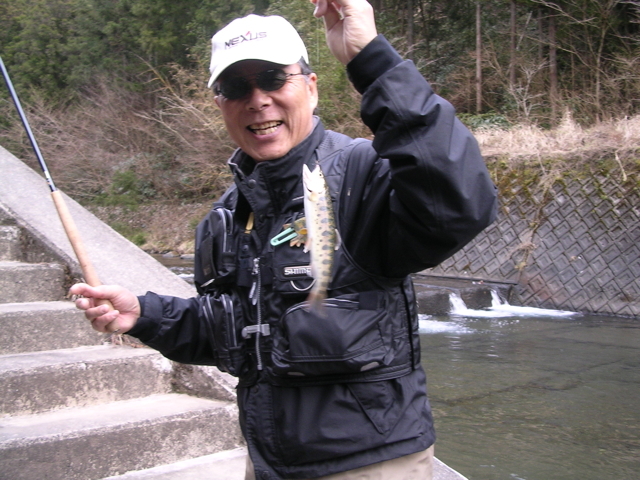 Dr. Ishigaki: Sakakibara-san is a magician of Tenkara. He is much more skilled in Tenkara than me. His technique is supported by his intuition like a wild animal. He is not a man of words. He is a man of instinct. His sense is so keen that most people cannot follow him. He is a long friend of mine, and we have fished together for countless times. So, I have many episodes with him. For example, he doesn’t wear polarizing glasses. He says he doesn’t like them because he can see trout “too well” with polarizing glasses. Everybody tries to see fish with polarizing glasses, but he doesn’t need them because he can see anything underwater without them. At one time, he indicated a big fish under a glaring water surface. I couldn’t see the fish even with polarizing glasses. I tried to find it, but I couldn’t. He just said, “There is a fish”. Though I couldn’t see anything, it seemed his fly fell in front of the trout, and the fish took the fly. I can tell this because he yelled “Fish!” and indeed he had fish at the end of his line. Why he can see through water so well, I don’t know. All I can say is that he is a man of remarkably keen perception. This was already 15 years ago, but I never forget the scene. Adam: I enjoy making new fishing friends yet I typically fish alone or with one friend. I know you help many people with learning the skills of Tenkara because much of the press I see of you is classes or seminars. I have fished with Tenkara for many years. I caught many fish. I have experienced various things in Tenkara. I feel greater joy when a friend or a person I taught Tenkara catch fish, than the time I catch fish myself. I feel happy to see the person is delighted. I don’t want to catch many more fish, though I have desire to catch bigger fish or beautiful fish. Now for me, it’s more fun to catch people than trout. The people who say like, “I caught trout!”, “My Tenkara improved!”, or “It’s been a great fun.” after attending my classes, are all hooked by me. My motto is “The person who fish people is the true master of fishing”. *: The majority of trout fishers use bait in Japan. Adam: Dr. Ishigaki, Thank you again for this opportunity to ask you a few questions. Again I feel it is an honor to have some of your time and knowledge. I will offer you this next answer to write about anything that you wish to choose. Please understand that I am thankful for your introduction of proper Tenkara techniques to the anglers you have visited in America. Thank you again for your participation here. Dr. Ishigaki: Thank you for giving me the opportunity to express my thoughts on Tenkara. As a Japanese culture, Tenkara has a long tradition. Tenkara reflects spirit of Japanese people. It is often said “simple is best”, and it’s true. The idea that you can fish with only a rod, a line and a fly, could be a hint to eliminate unnecessary things from our increasingly complicated life with much clutter. Tenkara, the fishing with the simplest tackle, could renew your fishing pleasure. I hope many more people will enjoy Tenkara in America.